A resource hierarchy is defined on a cluster of SIOS Protection Suite servers. For a given hierarchy, each server is assigned a priority, with one (1) being the highest possible priority. The primary, or highest priority, server is the computer you want to use for the normal operation of those resources. The server having the second highest priority is the backup server to which you want SIOS Protection Suite to switch those resources should the primary server fail. In an active/active group, all servers are active processors, but they also serve as the backup server for resource hierarchies on other servers. In an active/standby group, the primary server is processing and any one of the backup servers can be configured to stand by in case of a failure on the primary server. The standby systems can be smaller, lower-performance systems, but they must have the processing capability to assure resource availability should the primary server fail. Your physical connections and access to the shared resources determine your grouping options. To be grouped, servers must have communications and heartbeat paths installed and operational, and all servers must have access to the disk resources through a shared SCSI or Fibre Channel interface. For example in the following diagram, there is only one grouping option for the resource AppA on Server 1. Server 2 is the only other server in the configuration that has shared access to the AppA database. 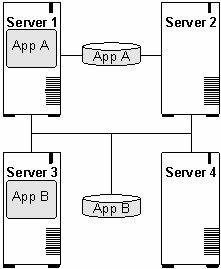 The resource AppB on Server 3, however, could be configured for a group including any one of the other three servers, because the shared SCSI bus in this example provides all four servers in the configuration access to the AppB database.